And now some more information and thoughts on various subjects in case the previous pages have not already been too much! may get the opposite. A majority of them DO shed - some more, some less. in the genetic health issues in the offspring, not a decrease. stand behind their stock and provide a refund or replacement for a puppy that has health, genetic or other issues. - People think it is fun (and lucrative) to cross breed, and then there are not as many homes as puppies. take responsibility for finding them homes. physique, longer legs and playful temperament, so often these are very active dogs that get very large. As with any dog, it depends greatly on the temperament of the parents, but there are many Doodles that are more relentlessly energetic than the average of either parent breed. Why shouldn't I adopt a dog from a shelter or rescue organization? "Adopt, Don't Shop". People are increasingly being conditioned by appealing media campaigns to feel that this is the only "right" course of action. But is it? Read on. The growing "retail rescue" business in this country - some are now calling it the "rescue racket" - has spawned an industry that is creating a big demand for dogs, increasingly from other countries, bred in exactly the circumstances most of us would like to discourage. in shelters needing homes." But in fact, the domestic canine "overpopulation" problem in this country has lessened so dramatically in the last thirty+ years, that many shelters now routinely operate at less than full capacity, and there is an exploding, unregulated business of pet transporters that import animals and truck them (and fly them) around the country to keep local shelters "stocked". More and more, the US has become a destination for dogs from puppy mills and other irresponsible breeding practices in other countries, with a corresponding increase in previously unseen parasites and diseases coming in to this country that is alarming the veterinary profession. In the Portland area alone we routinely see over 5,000 dogs imported annually from outside the area and brought to local shelters, where they are then sold for several hundred dollars. This industry has become big business, replacing, but not necessarily improving, the vilified "doggie in the window" pet shops of the past. Paradoxically, these out of area and out of country dogs make it even harder to find homes for the local dogs that need them. Appealing ads and "shaming" publicity aimed at steering people away from responsible hobby breeders has resulted in a growing demand for dogs from the very types of sources that should be discouraged, not encouraged, and local dogs going unadopted. Animal advocates and even politicians are beginning to sound the alarm that the importation of large numbers of non-local and foreign animals is resulting in health problems in our local populations as well as local pets losing out on homes. A recent article in a rescue pet oriented magazine sounded an alarm with a prediction that in the near future there would not be enough available dogs to keep up with the demand at shelters. This article proposed various possible sources of adoptable dogs for shelters to seek out, finally even suggesting that it might ultimately be necessary to get "puppy mill" type breeders geared up to produce more puppies! What!!! Is this what we want to encourage by where we acquire our pets? Is providing a home for a shelter or rescue pet the only moral "high road"? Consider the question of what behavior and practices you want to encourage with your patronage - responsible breeding or irresponsible breeding. Also consider your obligation to your family and to your pet to maximize the probability that it will be a good match for all. hard time finding a new one. Please, if you are visiting shelters looking for your next pet, ask where the dog comes from! Try if possible to help a local dog! Breeders as Villains. Some animal rights organizations do not believe we should "own" animals at all, and have nothing less than the (non-publicized) goal of eliminating private pet ownership altogether. Their plan is that if private breeders that can provide dogs directly to the public are vilified, harassed and legislated out of existence, and pets can only be obtained from shelters already spayed and neutered, this will ultimately eliminate the source of all pet animals. Does this sound far-fetched? It does, but sadly it is not only true, the approach has already been amazingly successful on a number of levels. There is a long term, well funded, two-part plan to accomplish this: by promoting shelter adoptions, which ensures all animals will be spayed and neutered, no matter how inappropriately young; and to simultaneously make things very difficult for private breeders, through a variety of legislative and regulatory restrictions, as well as general bad press. Media campaigns literally have made "breeder" almost a bad word. Responsible hobby breeders of purebred dogs are given the same negative comments and publicity as the worst puppy mills, with the puppy mills and other irresponsible breeders ironically being encouraged by increasing demand for "rescues". By contrast, it is well proven that hobby breeders of quality purebred dogs do not contribute to shelter populations, and most of them sell all but future breeding stock on spay-neuter contracts. Spay/Neuter Issues. It is the practice at all shelters and rescue organizations to spay and neuter pets prior to adoption, regardless of age, even small puppies. Yet scientific studies are increasingly demonstrating that it can be medically and temperamentally harmful to spay/neuter dogs prior to puberty or even later. These adverse health results include a number of orthopedic problems because of the delayed closure of growth plates, several types of cancers, incontinence, hypothyroidism, pancreatitis and a higher rate of adverse reactions to vaccines. The results for temperament issues are worse. In particular, neutered males are more aggressive, not less, than unneutered ones, and the younger the dog is neutered, the more pronounced the effect. Studies have shown several problems with a significantly higher incidence in spayed/neutered dogs including noise sensitivity, fearful behavior in females, aggression in males, and generally increased reactivity. The bottom line is that for optimal health of your canine pet, it should not be spayed or neutered until the onset of puberty, and two years is even better. This will not be an option with dogs from shelters or rescue organizations. As a pet owner, you should have the option to maximize your pet's chances for long term good health. Cost. Many people also may feel they cannot afford a purebred dog from a breeder, not realizing until they have settled on a shelter dog that adoption fees have also climbed to several hundred dollars, sometimes an astonishing $600-$700 for a mixed breed of unknown background. And ongoing health and behavioral issues can make up any remaining difference in a hurry in veterinary and remedial training fees, with no recourse or support from the breeder. Predictability. The most major issue with adoption is not knowing if the dog you are considering will turn out to be right for you and your family, as issues of health, temperament, breed characteristics and background experiences are usually unknown. What we are not told is the high rate of return for shelter animals - a heartbreaking and expensive process for all concerned. A high tolerance for surprises, great flexibility and a capacity for remedial training is highly recommended for shelter adoptions. Research has shown that acquiring a pet from a responsible private breeder dramatically increases the satisfaction level experienced with the pet. Choice. There is much less variety in the types of dogs available in shelters today than in years past. We seem to have a huge preponderance of only certain breeds or mixes of these breeds. By contrast, there is almost infinite variation in the breeds available through private breeders with corresponding available choices as to function, size, coat, temperaments, vocalization (did you know that the beautiful Basenji does not bark? ), shedding, hypoallergenic qualities, and pleasing appearance, so with a little research, you can customize your dog search for your own family and living situation. Also be aware that most breeders of quality purebred animals are not making any money long term doing this! It is a labor of love for the breed. There is a saying in the horse world that I would adapt to the training of Poodles - "A Poodle must be trained the way every dog should be trained." Physical intimidation, yelling, or other negative reinforcement does not work well to train a Poodle. Poodles are sensitive, intuitive and just want your love. Positive, praise and appreciation will get you where you need to be with a Poodle. The more quiet and calm your voice, the more effective it will be. Use body language, hand signals and occasional treats. Teach an alternate behavior for any problematic situation. Always make your training positive. How should I help animal rescue efforts? How do I choose an organization for my support? Carefully. There are many organizations out there soliciting for your dollars and there are very great differences in the goals and methods and actual services provided by some of the most high-profile ones, even though their names are similar. Do NOT give money to an organization just because it has "humane" or "ethical" in its name, until you know for sure its goals and methods are what you want to support. One "Ethical" organization operates a 95% kill rate "shelter", with the philosophy that killing dogs is better for them than having them be "owned" by humans. One "Humane" organization rakes in millions and millions of dollars in donations, and pays out these millions in high salaries and retirement funds (and advertising), while making less than 5% of its millions available for shelters and activities that actually benefit pets in need. Make sure you understand what an organization stands for, and what they do with your money. Age and Your Dog. No, not the dog's age, your age! It is wonderful to finally be retired and have plenty of time to be with your new pet! It is a great time to get a dog. But also be aware that Standard Poodles often live to be 13-15 years of age. If you are in your seventies and wanting a new dog, you need to think about how old you are going to be when the dog is aged, and needing help getting into the car and so forth. If you are seventy, that could take you into your mid-eighties, when you may or may not be able to continue to care for a dog. When you are seventy, you feel great and think it's no problem. But at this age, things can change fast. 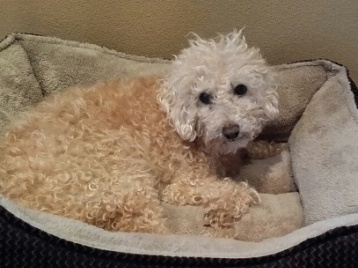 As rescue coordinator for the Columbia Poodle Club, the most heartbreaking and frequent call I get is from a relative who has just buried a parent, aunt or uncle, or has had to put them in hospice care, and now needs to find a home for the dog left behind. At this point, the dog is also aged, maybe with one or two health issues of its own, often never having lived anywhere else. There is no good answer for these dogs. I have tried in vain to find homes for them, as have the shelters they often are taken to. People just do not often adopt aged dogs that will have short lives filled with veterinary bills. If you are in your eighties, in good health, and would like a new pet, please consider the aged dogs in this tragic situation. Please, if you are considering adopting a young dog and you are over 70, do not do so without first having a plan!! A plan for who is going to take your dog if you become ill and/or die before you assume you will. You need to get a commitment from a relative or very close friend you can really trust, who is younger than you are, that they will (willingly and lovingly) take the dog. Then, you need to make an effort during the dog's lifetime to have it become acquainted with your chosen successor, and make sure the commitment continues. A bequest in your will to this person to defray costs, on the condition they accept your dog, is also appropriate. Come join our 4th annual party in 2019 for Poodles and all that love them. In our photography tent, only $10.00! Meet Bertie - our 13+ year old Hurricane Harvey rescue! He is an Apricot Mini and an ancient gentleman. Senior Miniatures and Mini mixes are one of types of dogs most often in need of adoption. Bottom Line. We need both good rescue organizations and conscientious private breeders to protect our local pet population and provide quality pets. Both have a necessary place in the pet world, and no one should be judged or made to feel guilty about choosing either one.